On Monday, I had Raye Wagner on my blog, telling her version of the Origin of the Sphinx. 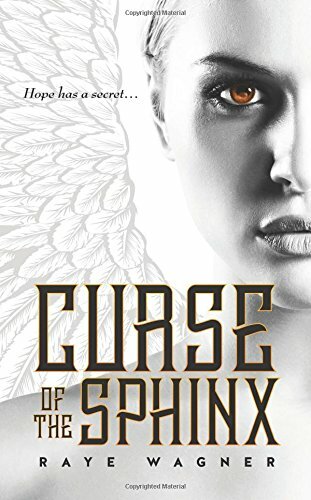 Today, I’ll be posting my review on the first novel of the series, the Curse of the Sphinx. As an author who focuses on modern day retellings, I’m always interested in how other authors approach the bringing the ancient into modern day aspect of the world building. Raye Wagner took a unique approach by making the Greek myths not just well known, but real to all the citizens in her society. Modern teens worship the Greek gods. Demigods are a known phenomenon walking among them. Monsters and curses are an every day part of life. The book maintains this fantastical sense of a magical AU without ever losing focus of the truly modern day. The high school is a normal high school, the students in it, just as much. This book *feels* like a really good representation of what the world would actually be like if all the magic of mythology was real. Everyone wouldn’t be a demigod, humans wouldn’t dare hunt/experiment/or otherwise go after demigods and monsters because friendly reminder, the greek gods do not take mortals trifling in their business lightly. Wagner pulled off a very believable society. The actual protagonist is a victim of one of those generational curses so common in Greek mythology. Readers hoping for more background should definitely check out the prequel. I’ve read it, so I can’t say whether or not readers would be lost without it. The romance was as anti-instalove as you could get. And the pace had a slow, gradual build up that kept me reading well into the night. I will say the story felt a little fragmented at first, but once the character arrives in Goldendale, the plot smooths out and takes off. All in all a very unique and interesting take on Greek mythology.